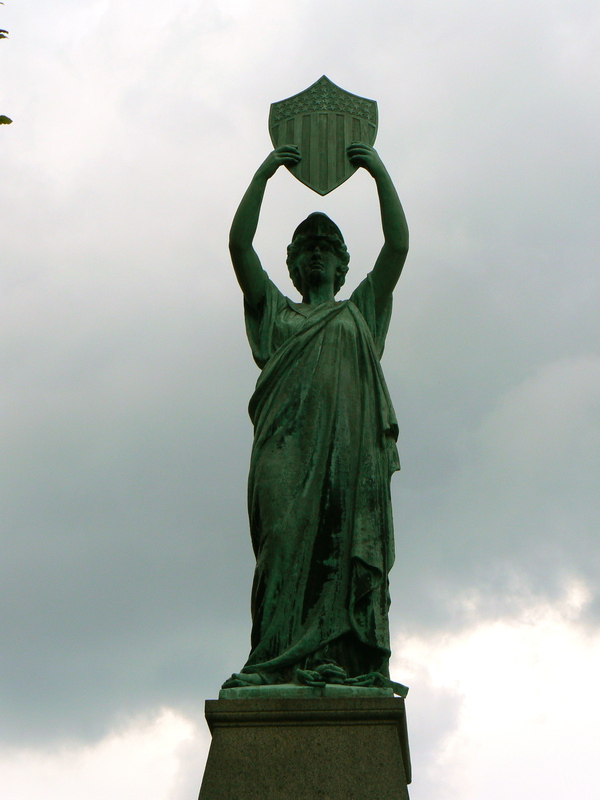 An allegorical figure holds a United States shield high above Salisbury’s green as part of the town’s 1891 Civil War monument. 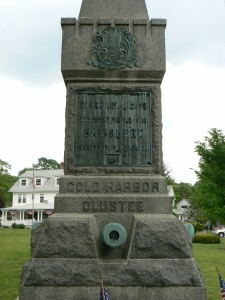 The figure stands atop a square granite base featuring cannon muzzles protruding from each side of the base in an arrangement that is not duplicated on other Connecticut Civil War monuments. The inclusion of cannons in the original design of the monument (for many monuments, government surplus cannons were added long after the monument was dedicated) honors not only the service of local residents, but also Salisbury’s importance as a source of high-quality iron that was frequently used to cast cannons. 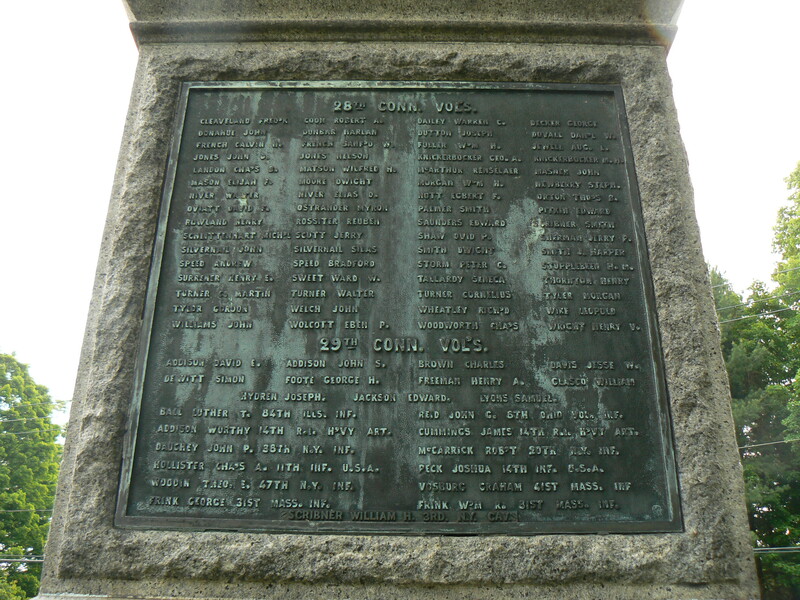 Along with listing local soldiers who fought with a variety of Connecticut regiments, the monument’s west face also honors Salisbury natives who fought with infantry, cavalry and artillery units in Illinois, Rhode Island, New York, Massachusetts, Ohio and the regular U.S. Army. 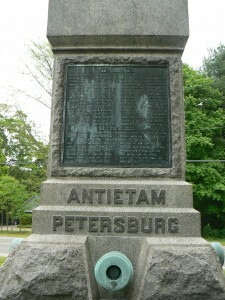 The figure atop the monument holds a United States shield aloft, and faces south. Broken shackles and a chain are visible near the figure’s left foot, similar to the shackles at the base of the Statue of Liberty. The Salisbury monument is known variously as the Columbia, Union and Freedom monument, depending on which source you consult. 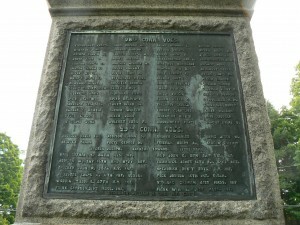 Rather than picking a side or adding to the confusion, we decided we wouldn’t be incorrect by describing it simply as the “Civil War Monument”. 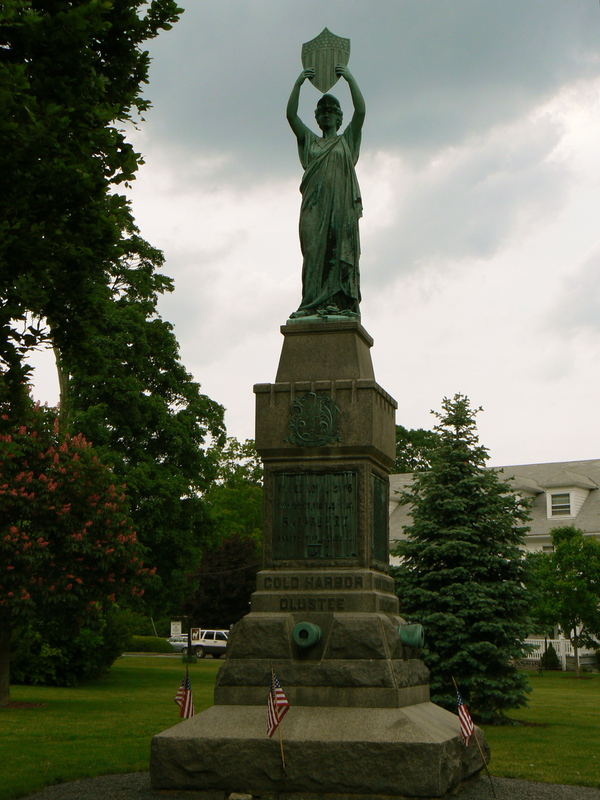 The monument’s sculptor, George Bissell, was also responsible for ornate Civil War monuments in Waterbury and Winchester (if you wanted a simple monument, Bissell was not the person to contact).